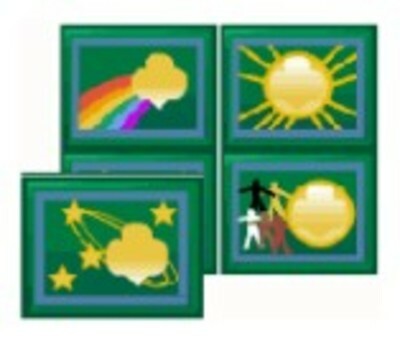 Girl Scouts is a great activity for homeschoolers, particularly unschoolers. They address many age appropriate topics for girls, educating them in a non-sexist way, on a whole range of topics with a whole range of activities. The badges they earn are leading them towards a good understanding of themselves, the world they live in, and the many things they can do independantly, both now and in their future. A well run girl scout troop is a joy to behold, and depends on the troop leader, assistants, helping parents and the girls themselves of course! Louisiana Sue is our Junior Girl Scout leader, and she does a superb job, mixing humor into everything along the way. This friday night we had a lock-in, this is where the girls get to sleep overnight locked in somewhere. What goes on? Karioke, board games, nail polish, pillow fights, balloon games, scavenger hunts, pizza, brownies and a couple of good movies. To take advantage of the leader and her parent assistants all being in one place LOCKED IN for the evening, we planned the year to come. We are sharing our planning work, to give some insight into the types of things a girl scout will learn in a year. Here is the summary of the Junior girl scout badge names and how we have planned it for our troop which spans girls in their first, second and third year. July 3rd weekend - girl scout swim party, water fun merit badge. May 15 - LOCK-IN, presentation of badges and awards. Now I tell you, is that a pretty good curriculum or what?